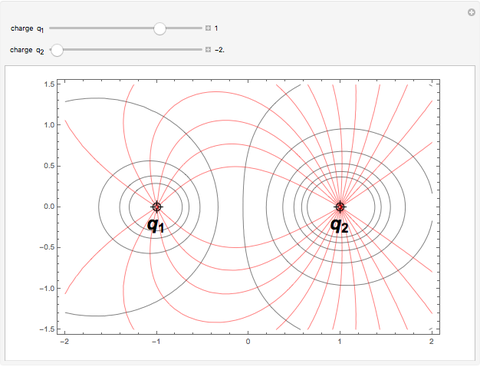 In an earlier Demonstration by Stephen Wolfram, two-dimensional equipotential contours , representing cross sections of equipotential surfaces, were plotted for two point charges of variable magnitude and location. 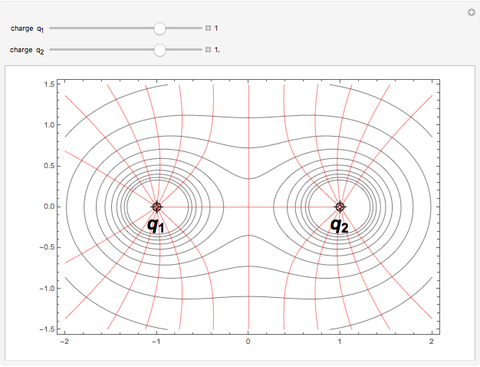 It was also possible to make a vector plot of the corresponding electric field . It is much trickier to plot the lines of force emanating from a positive point charge and converging on a negative point charge. These are everywhere tangent to the electric field vectors and form a set of contours , shown as red curves, everywhere orthogonal to the equipotentials , shown in gray. Derivation of is quite complicated in either Cartesian or spherical coordinates. It is, however, straightforward in prolate ellipsoidal coordinates defined by the variables and . Here and are the distances from the field point to charges and , respectively, and is the distance between the two charges. 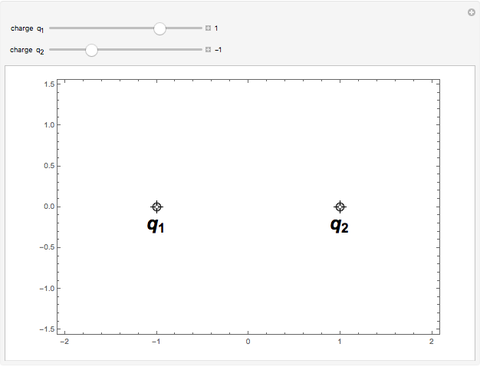 Expressed in the Cartesian coordinates of the graphic: , , . The equipotentials are given by . The function representing the orthogonal network of lines of force must then satisfy the equation . The solution , transformed back to Cartesian coordinates, is represented by the red contour plot shown in the graphic. S. M. Blinder "Lines of Force for Two Point Charges"